Elizabeth and I got back from Paris a week ago today. While there we were deeply immersed in French history. She was reading The Guns of August, about the years leading up to World War One, and to understand any of that we had to keep dialing backwards into the nineteenth century and the various paroxysms of French society in that time. One day, walking through the old Jewish ghetto--only a few blocks from the office of Charlie Hebdo, though of course we didn't know it at the time--we came onto the Place de la République, which is where all the huge gatherings have been this past week and where the march yesterday began and ended. 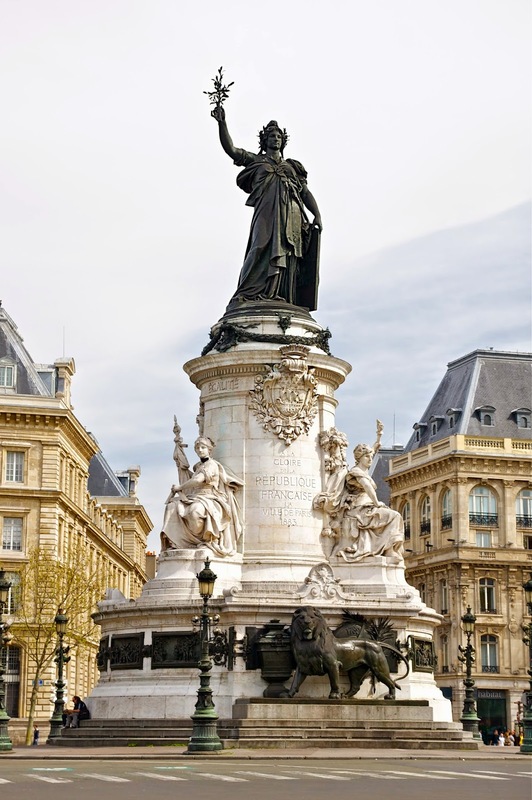 It's vast, must be more than a quarter-mile across, and in the middle of it (prominent in all the photographs of the demonstrations) is an enormous, stunningly beautiful statue of Marianne, the symbol of French liberty. The day we were there, there were very few people around. Cars go around the outside, but the plaza itself doesn't have much in it other than some bare trees and that enormous statue. 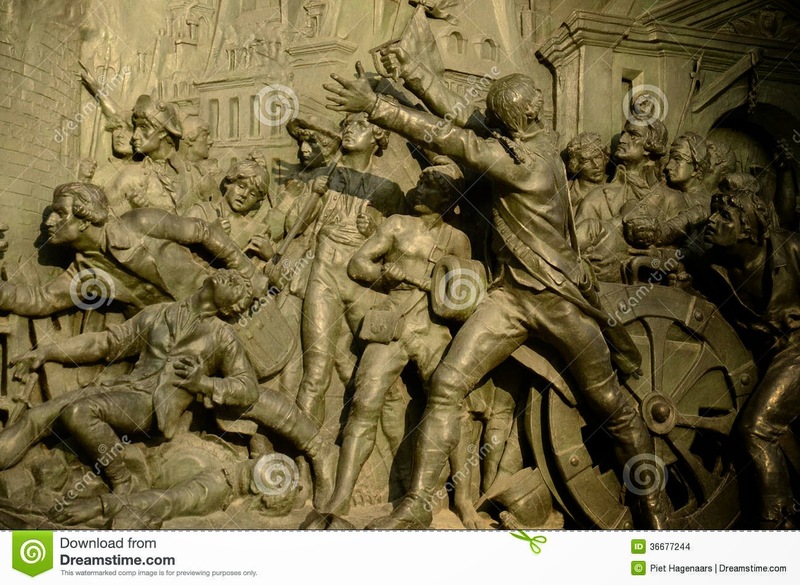 We went to look at it up close, and found that around the bottom are a series of bronze bas-reliefs of crucial scenes of French history from the Revolution forward. Some are bloody, and others represent culminations of horrible bloodshed. Now another bloody possible turning point: the killings at Charlie Hebdo and the Hyper Kasher market. It's hard to know what to make of those and what's going on now and what may be to come--such complexity--but I find myself turning to one of the other main activities of our time there (besides eating), viz., looking at art, specifically the stuff that I always am most moved by, Italian Renaissance. 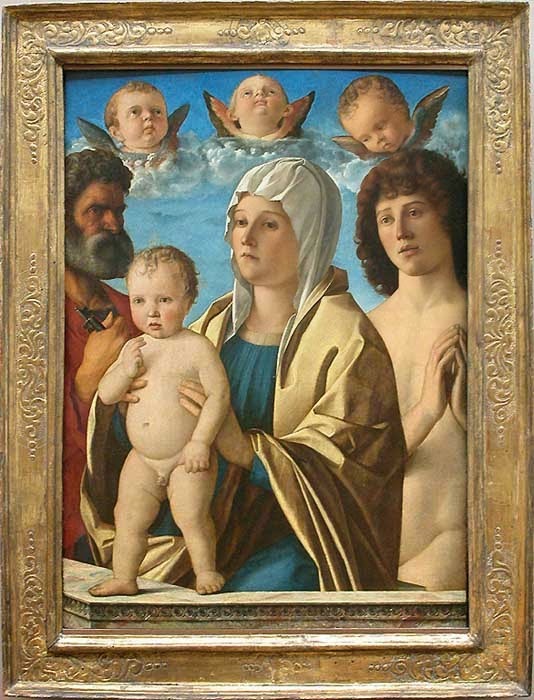 I can't say I have a favorite artist from the period, but certainly near the top is Giovanni Bellini, and one of the reasons, besides the sheer beauty of his work, is the particular way in which some of his Madonnas seem to be looking somewhere else, far away, a way I (over? )interpret as (fore)seeing the Crucifixion. There's a Bellini in the Louvre of the Madonna and Child with Sts. Peter and Sebastian in which everybody, including the baby Jesus, seems to be doing it. Even the little angels look pretty pessimistic. All this brings me to why, over time, in fits and starts, I've gotten interested, even involved, in the Church in its more Roman forms, with saints and all the trimmings (well, okay, most of the trimmings), especially the old-time versions of Mary and baby and John the Baptist and St. Jerome, et al., and most of all the Crucifixion: (I conveniently exclude miracles, resurrection, and a great deal of inconveniently confusing hocus-pocus): the pure, clear expressions of the innocence and the hope and the evil that live in the heart of every human being. 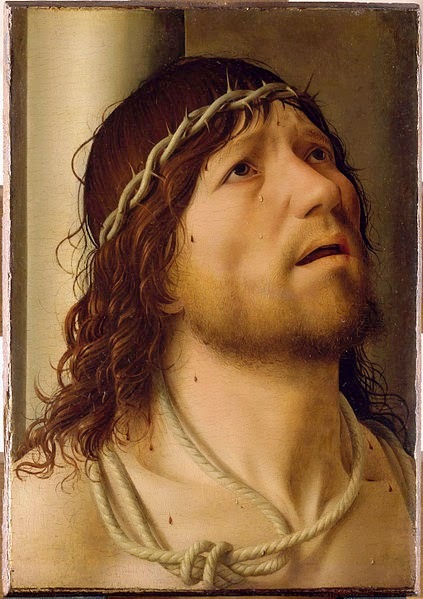 There's another picture in the Louvre, by Antonello da Messina (who moved from his home in Sicily to Venice in 1475 and was influenced there by Bellini), of Jesus wearing the crown of thorns but not yet on the cross, in sheer agony and terror. Is he looking up at the cross or at God, or both? Is he, like Mary in the Bellini, gazing horrified into the future? You could hang a "Je suis Charlie" sign on him and it would be perfectly appropriate. I've always thought of Bellini (one of my favorites too; has to be one of anyone's favorites) as looking not toward but past that crucifixion, toward an era in which humanity may finally have progressed beyond tribal anecdotes, or have burrowed beneath them, and have found the transcendant (and quotidian) realities which they have been given us. Bellini was truly an exceptional artist: a Mozart; a Dickinson. It is, I have to believe, the era in which most of us live; we must continually try to persuade others of this truth. Charles, it has taken me only two months to pick up your comment, but I'm very happy at last to have done so. I love the idea of her looking past the crucifixion. I'd add, perhaps, both looking at it and past it--hence, through it.